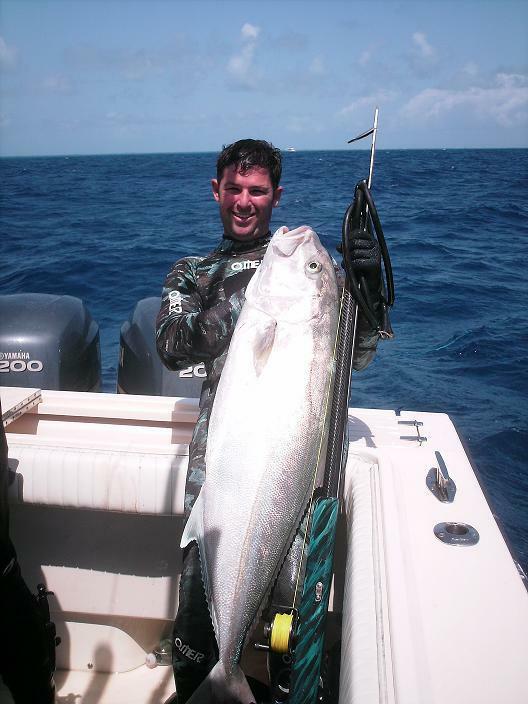 I was pretty excited to shoot this Amberjack. After work on Friday, My buddy Brian and I headed down from Deerfield Beach, Fl to see my Dad in the Keys. The West end of Marathon to be exact. When we arrived we discussed our plan and both Brian and I threw our bags on the floor and passed out. We woke up early on Saturday and met up with our dive buddy's James from Key West, and Jeremy from Marathon. We gathered our gear and casted off. We made it around the east end of the Island in no time. As we passed through Vaca Cut and ran toward the reef where a 3-5' chop insued. The nearshore waters were milky and white. I was hesitent to say it was going to be even diveable. Then, we neared the reef and came across the most definite color change I've seen this year. Opposite of the milk was clear blue ocean. We were in 40' and The vis was 70+ feet. We warmed up at a shallow spot and then made our way to a steel hulled shipwreck in 115'. From the surface you could see the super structure that neared 75'. 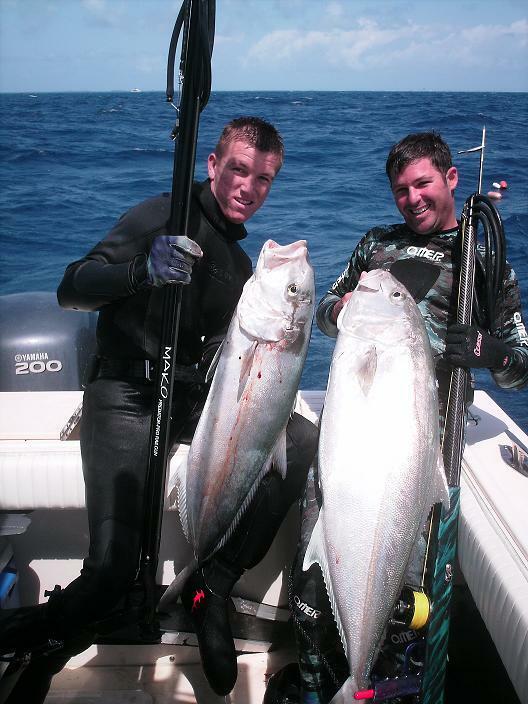 My first drop put me in the middle of a large school of amberjack. As I past up the smaller ones at the top of the school I found myself just above and behind the largest of the school. I lined up the shot and waited for the perfect moment. With a shot from above and aproximately 15' behind, I put the 65" Daryl Wong shaft through the middle of his back just behind his head. Before I could see if the shot had penetrated his entire body, he had smoked 3/4 of the line off my reel. Ascending as fast as possible, I finally hit the surface and worked the float line. 20 Minutes later after drifting away from the wreck with a Goliath trailing the AJ, I made it back to the boat. As I worked him up from 100+ feet the bulls came in to get a look. Being skeptical I hurried the fight and forgot that I might bend the shaft. Luckily, I got him up without any bite marks and with all my gear intact. As I swam him closer to the boat hugging him tightly, I noticed that the bulls had lost the adrenaline induced strikes toward me and returned to doing steady even circles beneath me. This calmed my nerves and I boated the fish. As I stepped over the stern I saw my buddy Jeremy had landed his first ever AJ. Just one more excited clan member amongst our great fraternity. My AJ wasn't weighed in because she is no record, but a fish to be proud of none the less. Hope you enjoyed the story and get out soon yourself! See attached Images! Hope you all enjoy.